Posted by pacejmiller in On Writing, Study. Admittedly, up until a few days ago, I was not a poetry kind of guy. I’m still not, not by a long shot, but at least now I can finally see why some people swear by it, and why it’s actually very useful for a prose writer to read. 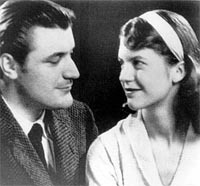 In my writing theory class, we recently studied poetics, and in particular Sylvia Plath and her husband and fellow poet Ted Hughes. Needless to say, I was initially less than thrilled with the prospect of reading pages and pages of poetry. The last time I read any “proper” poetry was in high school, and it was not voluntary. I was probably too young and lacked the maturity and appropriate grasp of the English language to appreciate the poems we studied. Besides, most of the students that proclaimed their love for poetry during my school years tended to be the biggest knobs/snobs who thought they were better than everyone else (with the exception of a few genuine geniuses). But anyway, now that I am older and slightly more mature (just a little), I must admit the Sylvia Plath poems blew me away, especially “Daddy” and “Lazy Lazarus” (the latter of which is perhaps her most famous poem). I know it’s a horrible cliche, but there’s no other way to describe it — it’s powerful stuff. Her choice of words, sometimes seemingly the simplest of words, somehow manages to conjure up images more striking and vivid than most prose I have read. It just shows you don’t necessarily have to have a broad vocabulary or a thesaurus to come up with writing that connects emotionally with readers. Another thing we looked at in class was the issue of authorship — that is, to what extent does authorship affect the way we read a piece of writing? Does our understanding of an author’s life and story influence how we perceive the work? Well, in the case of Sylvia Plath and Ted Hughes, the answer is definitely yes. The more I looked into the life of Sylvia Plath, the more haunting her poems became. Before last week, the only thing I knew about her was that she was a famous poet and there was a film made about her starring Gwyneth Paltrow and Daniel Craig a few years back. Little did I know about the crazy melodrama behind her poetry that is more gripping than any movie or novel. Plath was born in 1932 during the Great Depression and her father died when she was just eight following complications from an amputated foot (due to diabetes). She suffered from depression and first tried to commit suicide at around age 20, though she was unsuccessful. She was later awarded a Fulbright Scholarship to Cambridge University, where she met fellow poet Ted Hughes at a party. Hughes apparently had a girlfriend at the time but Plath decided she had to have him, and they ended up marrying in 1956. The two continued to write poetry, though Hughes did it full time while Plath also had to take care of all the chores of a housewife. They had two children but the marriage was difficult, partly due to Hughes’ affair with Assia Wevill, a beautiful married woman who once rented their property. Plath and Hughes separated in 1962 and she moved into a flat where WB Yeats once lived. Plath committed suicide in 1963, at age 30, by gassing herself in the home oven while her infant children slept in the next room. The best poems Plath wrote came just before her suicide, and you can really sense the pain and loathing in her writing. Knowing Plath intended to kill herself when she wrote these poems really amplifies the raw emotion already contained in them. But that’s not the end of the Plath saga. Assia Wevill was apparently pregnant with Hughes’ child when Plath committed suicide, and she terminated the pregnancy soon after. Wevill eventually gave birth to Hughes’ daughter in 1965 while she still married to her old husband. However, the stigma of being the woman who broke up Plath’s marriage and Hughes’ later affairs with other women was too much for Wevill to handle, and in 1969, she killed their daughter then herself with the home oven — in the same way Sylvia Plath had seven years ago. Ted Hughes didn’t comment on his marriage to Plath until almost 30 years later in 1998, when he released a poetry collection called Birthday Letters, which had some real whoppers too that seemed to be a direct response to his complex relationship with Plath. He died later that year from colon cancer. Nicholas Hughes, the son Ted Hughes had with Sylvia Plath, committed suicide in March 2009 following a bout with depression. He was 47 years old. Tell me that isn’t one insane story! Now thanks to YouTube, you can listen to Sylvia Plath recite her own poems, which, due to her powerful voice, makes them even more haunting. I’d recommend listening to “Daddy” and “Lady Lazarus” (preferably with the text of the poems side by side)– they still give me the chills, every time.